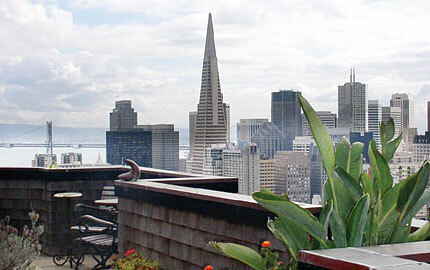 The Russian Hill Summit luxury town homes enjoy the world-renowned views of the San Francisco bay and its landmarks, including the Golden Gate Bridge & the Presidio to the west and the Bay Bridge and the dazzling lights of the financial district. 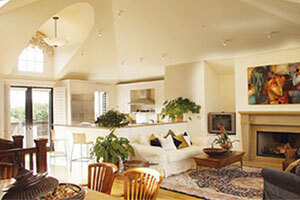 The quiet secluded location is traditionally regarded as one of San Francisco’s most sought after. The classic architecture in the style of Willis Polk blends well with its neighbors; black wood trim against aged wood shingles, tall French doors & windows. The open floor plan of the main level, with cathedral ceiling and expansive north and south view terraces are conducive to indoor & outdoor entertaining and comfortable City living. The lower bedroom level provides a tranquil and private environment. The wonderful open plan of the main level LIVING ROOM with DINING AREA and KITCHEN allows one to enjoy the light and airy ambience of Russian Hill living. The cathedral ceiling with north & south windows let in abundant natural light. Features include: a contemporary stone fireplace, bowl lighting, halogen spots for art, plantation shutters on the south windows and hardwood floor. GUEST BATH with pedestal sink. S/W BEDROOM with bay window and S/E BEDROOM, both with verdant outlook. Shared tiled FULL BATH. Laundry Closet with stacked washer/dryer.